Many patients say they procrastinated going to see a practitioner for their health because they think they will be told to stop drinking coffee, stop smoking or stop any number of other bad health habits that they are not yet ready to face. 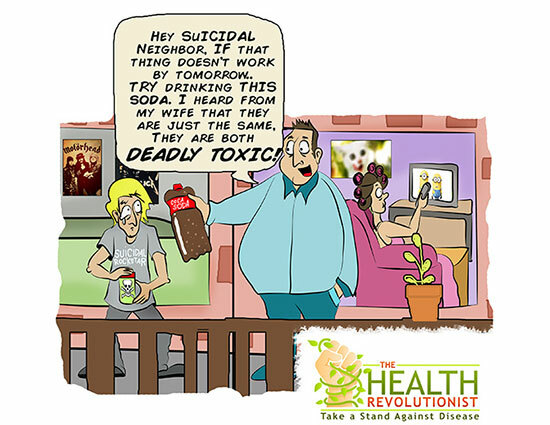 They are usually very surprised to learn what I consider to be the first bad health habit you need to give up… drinking sodas! All sodas, colas, red pops, orange drinks, etc., have no redeeming nutritional value whatsoever. They are horribly dehydrating, and they are nothing more than chemical and refined sugar cocktails. But, you say, you drink sugar free sodas? Even worse. You are better off sticking with sugar sodas than to poison your body with the artificial sweetener aspartame. We’ll get to the debilitating effects of aspartame later, just trust me for now, you don’t want it in your body along with the highly destructive effects to your brain and wellbeing. If you drink enough sodas, not only are you overloading your body with toxins, you are posing a serious health risk, for example, to your teeth and digestive system. I have listened to patients claim that they had to have all their teeth pulled because of decay and others who actually claim they had part of their intestines removed due to chronic soda drinking for years. If you want to begin the journey of restoring and improving your health, the sodas must go. There is no way around this. If you miss the fizz, drink a little natural fresh carbonated water with squeezed lemon or orange juice added to make a spritzer. Now, this drink does not replace the plain, pure water you need to drink every day, but it will help break your bad addiction to sodas. Switch now and you can cut back on this new carbonated drink once you have kicked the soda habit. Getting healthy is all about making healthier choices, moment by moment. The journey begins with the first healthy choice… Or shall we say, giving up sodas!